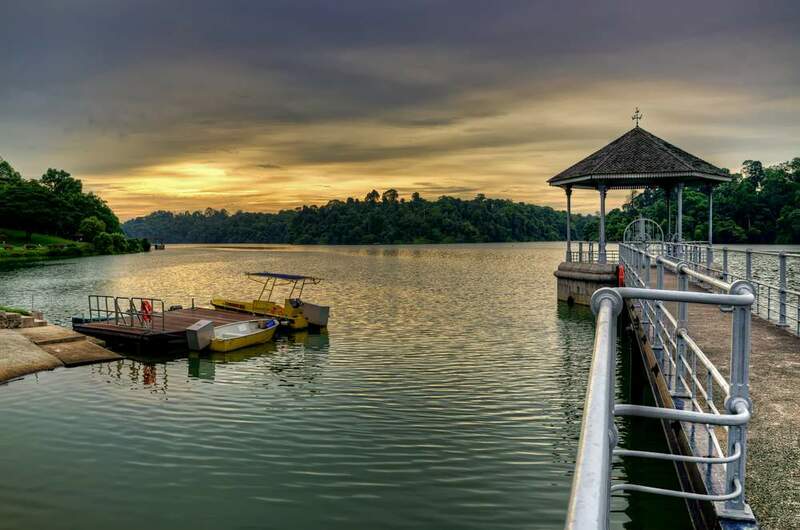 The treetop walk at MacRitchie is one of Singapore’s must-do activities. The highlight is a suspension bridge that connects two of the highest peaks in the reservoir, hovering 25 metres above the forest canopy below. From the height you can enjoy beautiful views for miles and peer down on the wildlife that inhabits the area, including 80 species of birds, flying lemurs and long-tailed macaques. 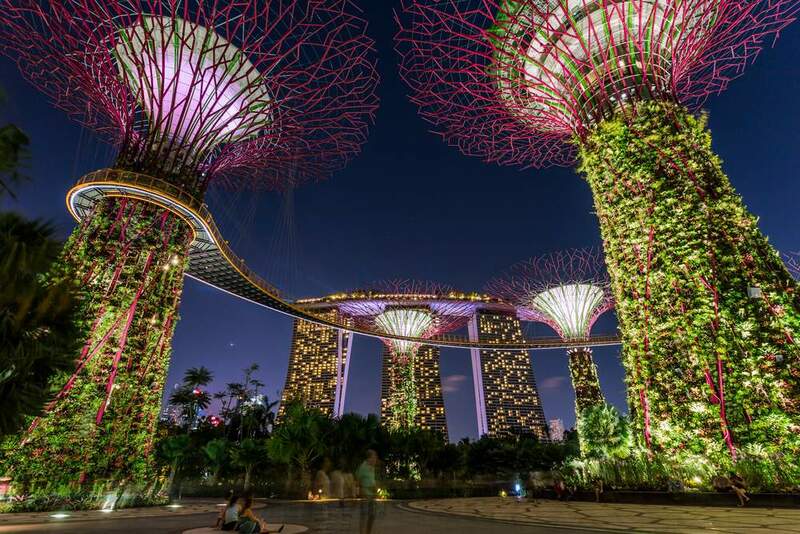 With Singapore being a big city, it’s easy to forget that it’s surrounded by a lush jungle landscape, but this experience will make you well aware of what the area has to offer. 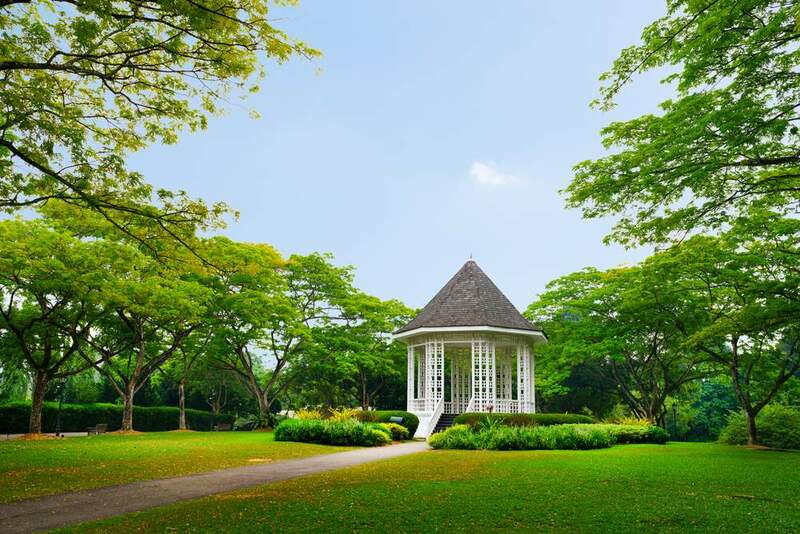 If you prefer to enjoy your nature from the comforts of the ground then consider the botanical gardens located just a short walk from Orchard Road. You’ll find a winding maze of paths occupying an area of 74 hectares containing a range of beautiful plant life. At more than 150 years old the gardens are the only tropical botanical garden to have been listed on the UNESCO World Heritage Site. It’s a nice retreat from the hustle and bustle of the city and a different way to experience the area for a few hours so check it out! 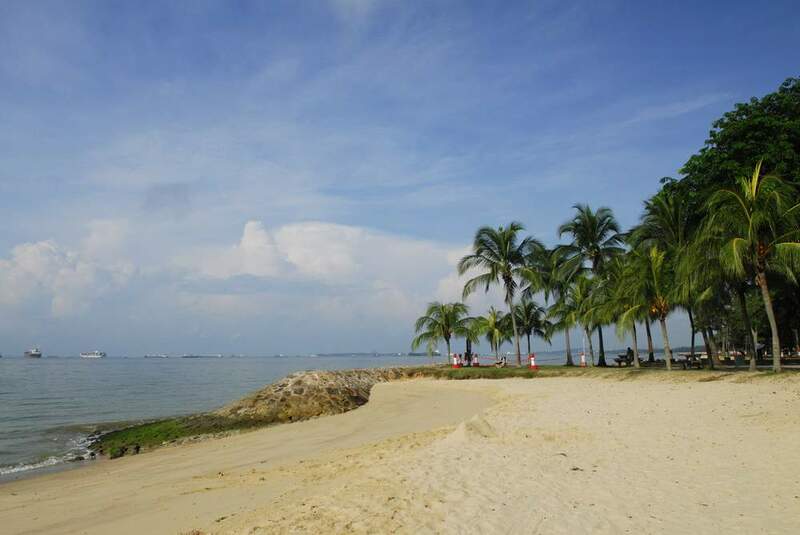 East Coast Park is a really great stretch of land that spans, well, Singapore’s east coast. Considering the size of Singapore, it’s a pretty massive space that lets visitors enjoy swaying palm trees, white sand beaches, camping and a host of activities like water sports, cycling, fishing and more. You can entertain yourself all day with the available options and relax at one of several restaurants or cafes located within the site. You’ll also find open barbecues on hand if you feel like doing your own cooking. When the sun is shining it’s one of the city’s best spots. The 56th floor of the ION Orchard allows visitors to see some of the most impressive views that Singapore has to offer – and best of all, it’s FREE! You’ll need a booking to get up there but that can be done easily online at this link – Ion Sky. The lookout comes with telescopes to get up close and personal with the city’s best man made and natural landmarks and if you do feel like a spending a few Singapore dollars then the 55th floor offers the Salt Grill and Sky Bar from celebrity chef Luke Mangan. The Southern Ridges span 10 kilometres of open paths that connect some of Singapore’s most treasured national parks and nature reserves. It’s a beautiful place to visit if you’re looking to get away from the crazy city and you’ll see some pretty amazing views of Singapore and the surrounding areas. On top of that you’ll walk through lush landscape and be able to spot plenty of native birds along the way. If you’re afraid of heights then this may not be the best thing for you as most of the ridges are made up of elevated pedestrian walkways. 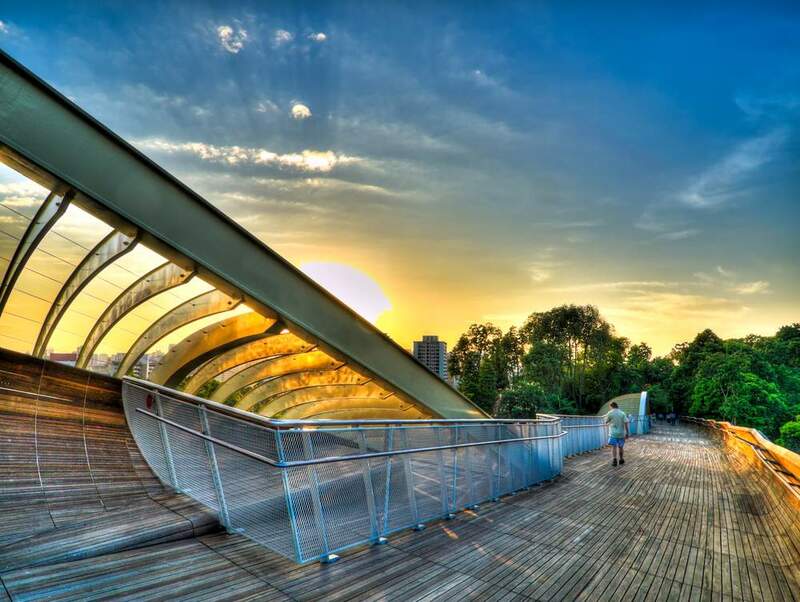 The most famous is the Henderson Wave, which sits 36 meters above Henderson Road. The Esplanade is a massive performance space located on Marina Bay. It’s one of the world’s most state-of-the-art spaces for music and theatre and although many of the performances are ticketed, there are range of free shows put on throughout the year that you can see. You’ll find a host of events like concerts, art installations, dance performances and more. 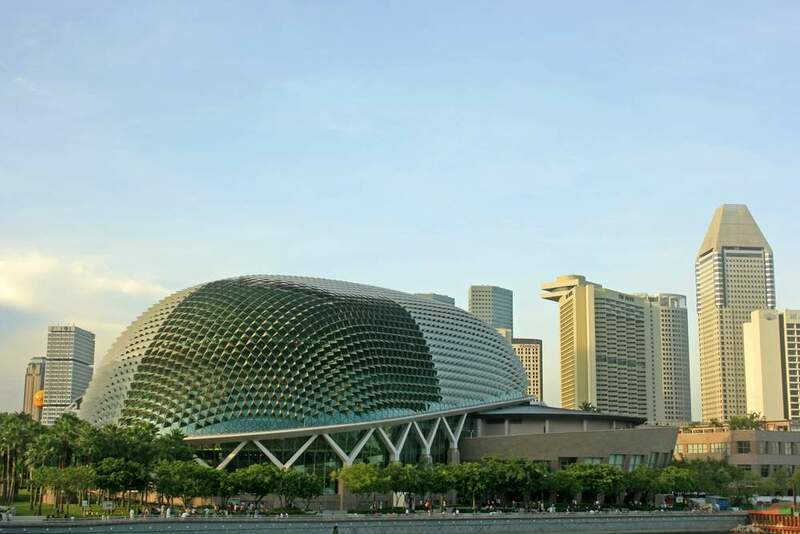 Check the What’s On – Esplanade to see up coming events! Located just on the other side of the marina from the Esplanade is Gardens by the Bay, a beautiful and also enormous park made up of several incredible gardens both indoors and outdoors. One of the Gardens’ most recognisable features is Supertree Grove, a series of large man made tree structures that act as vertical gardens. They also light up at night and create a very cool effect to be around so we encourage all visitors to go there at night. Plus, it’s down by the marina and it’s a great way explore the city! Search Cheap Flights to Singapore or Browse our Holiday Deals!